Do not be fooled by the propositions of SaverPro. Even though this application promises you beneficial services in return of its installation, we have found out that the program is more disturbing than helpful. It is most likely that after the installation of this application is completed, an avalanche of random pop-ups and banner offers will be produced. Continue reading the report to learn why trusting these could be dangerous to your virtual security, and how you can delete them from the browsers. We also review SaverPro removal. When you click the download button on saverpro.info – nothing happens. The link is inactive, and we believe it has been disabled a long time ago. The application does not have a good reputation, and so there is no other reason for an official page than to trick computer users into trusting an extension which might have been installed illegally. Keep in mind that unauthorized programs require immediate removal. Even if you are offered to accept or decline SaverPro installer, we still indicate that its installation is illegal because it is based on false information. The same has been noted with DiscountLocator, RealDeal, TicTacCoupon, RoboSaver, and other plugins, all of which are distributed with InstalleRex-WebPick installers. SaverPro is infamous for its ability to randomize its own name. It cannot be changed after the installation; however, the program may be installed with a different title on every system. SaVerProo is one of the many variations which you may face. What is the point of this? Unfortunately, this is supposed to help avoid removal. If you install automatic malware removal software and it is not updated in time, it may fail to detect and delete SaverPro. Even computer users who choose the manual removal option may be confused about the program they should delete from the PC. All in all, the longer you keep the plugin running, the more vulnerable your virtual security gets. The application uses intrusive web cookies and displays the sponsored links to unpredictable third-party sites. Any virtual security expert would recommend SaverPro removal. This application is related to virtual security risks that outrival the advantages. Why would you keep a useless program running if it could expose you to unreliable links and aid unfamiliar parties? 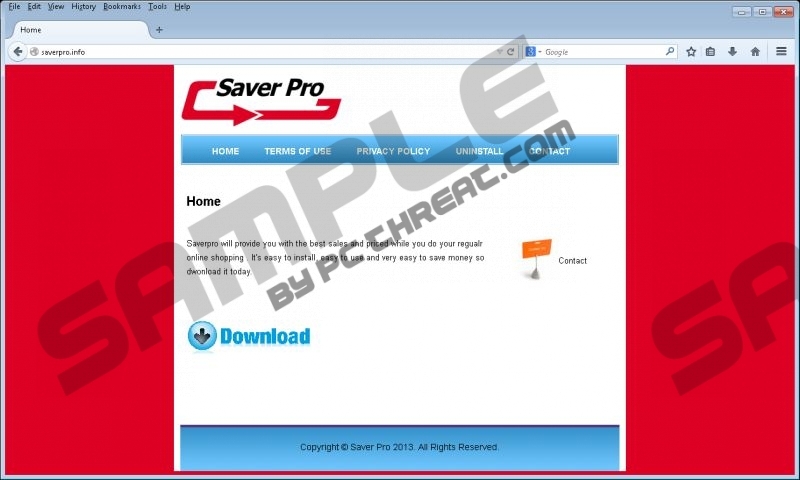 Click the download button to acquire a tool which will find and delete SaverPro automatically. If you believe you are ready to handle this adware on your own – follow the manual removal instructions below. Select Control Panel and double-click icon Add or Remove Programs. Remove the undesirable application SaverPro. Open the Windows menu from the Task Bar. Right-click on the Metro UI menu to open a pane and select All apps. Quick & tested solution for SaverPro removal.